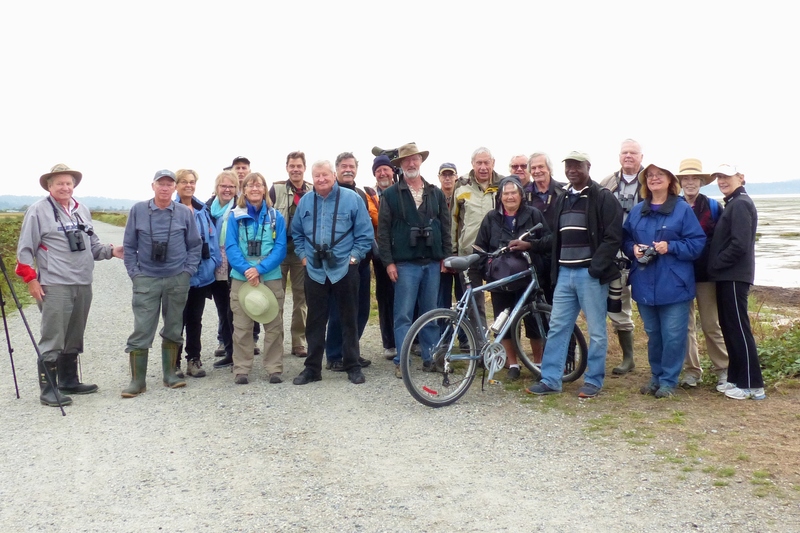 Twenty-three (wow) DNCBers enjoyed a walk on the mud and the path at the 104th St. entrance to the Boundary Bay dike path. Lots of migrants in the Bay and we had some good sightings on a cloudy but comfortable Wednesday morning. Check out photo evidence on our new DNCB Group Flickr site at: https://www.flickr.com/search/?group_id=3027315%40N23&text=2016-36&view_all=1. We met at 8:00 am at the Heritage Airport parking lot at the 104th Street entrance to the Boundary Bay dike path. The tide was way out, but we could see lots of Black-bellied Plovers and ducks and gulls in the distance. We decided to walk the path toward the Mansion and wait for the incoming tide to bring the Shorebirds in closer. Of course, our intrepid explorer Roger marched out onto the mudflats to get closer to the shorebirds. We saw little birds in the shrubs along the path including: Song, White- & Golden-crowned, and Savannah Sparrows (Lincoln’s? ), Common Yellowthroat warblers, and American Goldfinches. As for Raptors, a Peregrine raised the Shorebirds as it flew along the distant water’s edge; a Merlin raced over us; we spooked a Cooper’s Hawk which flew inland into the bushes; and a Northern Harrier glided over the fields where several farmer’s machines were harvesting Beets. A few Shorebirds were close to us on the trail. We had fun distinguishing Pectoral (yellow legs) and Baird’s (black legs) Sandpipers. Killdeer were easier. Out on the mudflats, Roger would phone regularly to say he saw some Sanderling, Dunlin, or Peeps out there which he identified as Least and Semi-palmated Sandpipers among the plovers. Lots of Ring-billed Gulls and Great Blue Herons there to. Thousands of ducks were in the water beyond the shorebirds; we could ID only Green-winged Teal, but know there were other species. Although we didn’t see them, other birders that morning saw a couple of Red Knots, a Marbled Godwit, Whimbrel and both American and Pacific Golden Plovers among the Black-bellied Plovers. We were blanked on our target birds the Ruff and Buff-breasted Sandpipers, also seen earlier in the week. Walking back from the Mansion the American Pipits finally appeared for close looks. Roger was enthralled with the different plumages of the European Starlings. And a confusing flock of immature Brown-headed Cowbirds landed in a small tree. Although we could see the different plumages of the Black-bellied Plovers (some still had black bellies), by noon the tide had not come in as much as we had hoped, so the birds were still a long way out. So we aborted the outing and went to the RiverHouse Pub in Ladner for lunch. Although the RiverHouse is next to my home, I had a meeting so didn’t stay for lunch, but I was told the fare was tasty for the 10 DNCBers. The twenty-three were: Roger M who finally persuaded Chris McV and Mike B to join him out in the mud, Rob M, Marion S, Kirsten W, Margaretha, returnees Jonathan & Lorraine, Ken & Anne, White Rock’s Al & Alice, North Van Rick H, Burnaby Fisherman Roy (back from Haida Guai) & Solveig, Langley’s Wim, Flickr Guides Glen B & Ladner Jack Mac, photog’s David M & Liz S, our youthful member Eric L and me. With so many participants, some of whom were even a bit interesting, it was a real chatfest, so it didn’t matter that the group was often spread out and we didn’t have a hi-lite reel of sightings. Nonetheless, another super DNCB outing. Next Wednesday, September 14, is our quarterly Birds on the Bay outing. We will meet at and leave from heritage Cammidge House at 9:00 am on our 2 ½ hour amble around Boundary Bay Regional Park – see Rochelles’s Poster for details. FYI, last Saturday, we had our last Car Boot Sale at Centennial Beach, as well as our last DNS Display event at the Day at the Farm on Westham Island. Both these events were very successful; thanks to the many Nats members who volunteered at both. This entry was posted in *DNCB, 104 Street, American Pipit, Black-bellied Plover, Boundary Bay, Cooper's Hawk, Delta Heritage AirPark, Dunlin, Least Sandpiper, Merlin, Northern Harrier, Pectoral Sandpiper, Peregrine Falcon, Semi-palmated Sandpiper. Bookmark the permalink.